Someone slipped BEANO (not the anti-gas medicine!) the British comic book, under my door. This was just before break, during exam week. I was thrilled and amazed. I hadn’t seen a copy since I was in England in 1995 teaching British Humorous Illustration as part of the KU/UK program. This copy is dated July 30, 1938 with Big Eggo, the ostrich, on the cover. I thought it may have come my way because on my door hangs a woodblock print of an ostrich that I carved at Evil Prints. I took Beano home in my backpack and read most of it in bed. 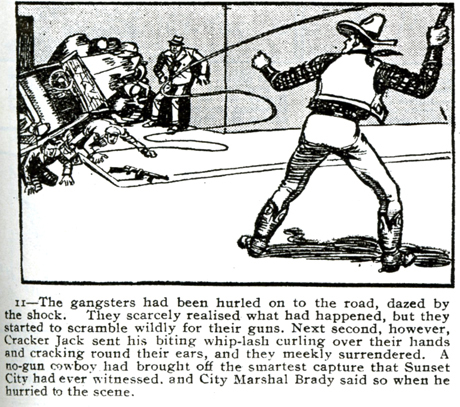 It is a strange mix of cartoon styles, some very juvenile gags, a few more sophisticated adventure strips, including one about a bullwhip expert, Cracker Jack. Some pages have more text than pictures. The drawing styles are varied, often charming, and with distinctively British characters. It occurred to me Beano is quite different from the famous U.S comic that also appeared in the summer of 1938, in which Superman made his debut. 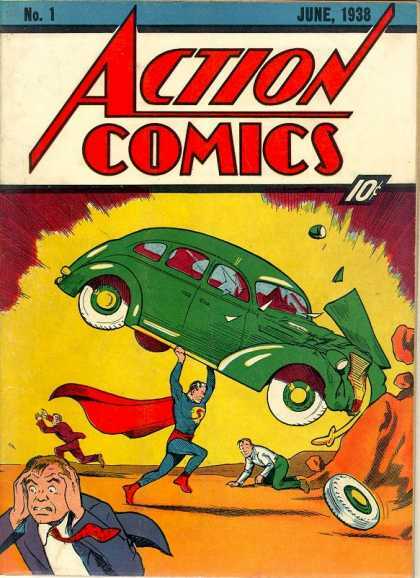 Everyone knows Superman’s Action Comic, Number 1, is worth a fortune. In 2010 a mint copy sold for 1.5 million dollars at auction. I wondered about the value of Beano, Number 1, and who had slipped it under my door. I googled Beano #1 and found a blog about a recent EBAY sale. Better yet, there’s a video about Beano’s value on a UK version of Antique Roadshow. Beano # 1 is worth about 4,000 pounds, more if it still has the free Whoopee Mask (1 British pound = 1.54 US dollars, over $6,000.) I emailed these links to Elaine Cunfer telling her I couldn’t accept such a valuable gift, but asked if I might to scan a few of these amazing illustrations before returning it. 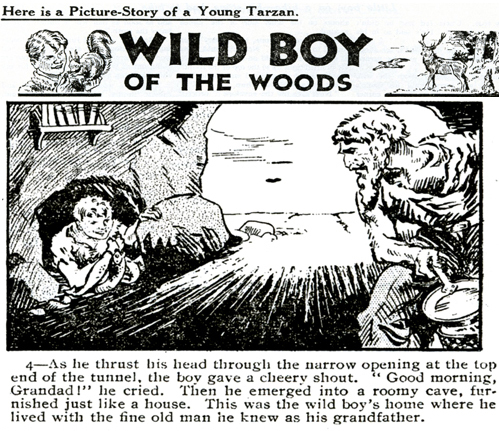 A panel from Wild Boy, Beano #1. More scans below. Elaine Cunfer wrote back to tell me this Beano was a reprint that came with the Sunday Funnies. She got it last time she was in England. She was touched that I wasn’t intending to rip her off. “My” Beano has 24 pages, a real 1938 Beano has 28 pages. Beano’s original 1938 masthead features a crude caricature of a grinning black boy eating watermelon, not the sort thing you would find in mainstream comics today. During the World War II years, Beano was filled with equally crude anti-Italian caricatures and slurs. These are not the things I like about Beano, but any popular magazine is a time capsule. And alas, unedited time capsules include some ugly curios among the gems. The U.S. is no different from England in this respect. I’m guessing the missing four pages might have featured a story about the boy with the watermelon. If anyone can shed light on the mysterious missing four pages, please do get in touch. 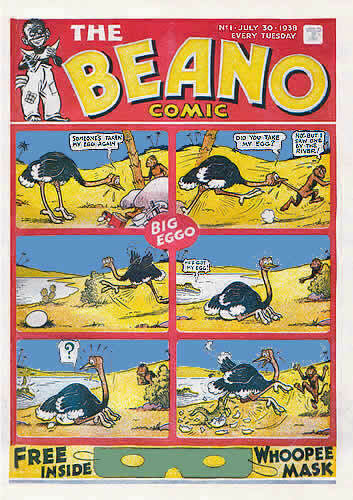 Here, below, is one of the original Beano comics in its entirety, Ping! illustrated by Hugh McNeill.